Click here to order in both MP3 and WAV formats. BUYSOUNDTRAX Records presents the original soundtrack for WIND, the 1992 drama directed by Carroll Ballard, written by Rudy Wurlitzer and Mac Gudgeon, starring Matthew Modine, Jennifer Grey, Cliff Robertson, Jack Thompson and Stellan Skarsgård. 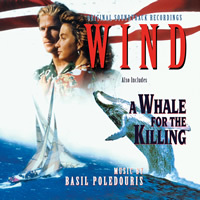 Also included is the composer’s score for A WHALE FOR THE KILLING, a 1981 television movie directed by Richard T. Heffron, based on the book written by Farley Mowat, starring and co-produced by Peter Strauss, along with Dee Wallace, Kathryn Walker, Bruce McGill and Richard Widmark. WIND tells the story of young sailor Will Parker (Matthew Modine) as he rises in the ranks to join the American sailing team to compete in the America’s Cup sailing competition. The film is inspired by the real life events surrounding the first time the American team lost the America’s Cup to another country. Will is invited to join legendary American skipper Morgan Weld's (Cliff Robertson) racing team to train and compete in the America's Cup. When the team loses the race to the Australians, Will is held responsible and kicked off the team. Months later, an opportunity presents itself for Will to build his own boat, compete in the race and possibly reclaim the America’s Cup from the Australians. A WHALE FOR THE KILLING tells the story of Charles Landon (Peter Strauss), an ecologist from New York who finds himself stranded in a small village in Newfoundland with his family after a storm has blown them off course. When a humpback whale is discovered stranded by the same storm in the town’s lagoon, Charles sets out to save the whale’s life from some of the local townspeople, who have their own plans for the whale. Basil Poledouris was born on August 21, 1945 in Kansas City. He started taking piano lessons when he was 7 years old. Eventually, he went on to become a student at USC, where he studied directing, cinematography, editing, sound and music. In over two decades of scoring motion pictures, he has proven himself a master of melody and emotional power, forging rewarding creative relationships with directors such as Paul Verhoeven, John Milius, Randal Kleiser, Simon Wincer and John Waters. Basil has composed music for films such as BIG WEDNESDAY, THE BLUE LAGOON, CONAN THE BARBARIAN, RED DAWN, ROBOCOP, FLESH AND BLOOD, QUIGLEY DOWN UNDER, THE HUNT FOR RED OCTOBER, LES MISERABLES, STARSHIP TROOPERS and FOR LOVE OF THE GAME. For television, he composed music for the epic miniseries AMERIKA and LONESOME DOVE, for which he won an Emmy in 1989.